NRIs have many questions & at least I haven’t found a single source where they can get all the answers – and then I started WiseNRI. I keep getting a lot of questions from NRI clients & blog readers so I am sharing most frequently asked questions by NRIs. You can also ask questions in the comment section. 1) I am an NRI. How can I e-file my tax returns? Choose the correct ITR form. You can e-file your returns or download the relevant ITR complete and upload it. You will get an acknowledgment on receipt of the form. It can also be verified using a digital signature. 2) Can I buy real estate in India as an NRI? Are there any restrictions? There is no restriction on NRIs for buying residential or commercial properties. But NRIs cannot buy agricultural land or plantation property or farmhouses in India. NRIs can avail of loans for purchase of real estate and are provided the same tax benefits that are provided to Resident Indians for purchase of property. 3) I will be sent abroad for an assignment/project for a short-term. How will my income be taxed? Going abroad on assignments and projects are exciting. You get to work with people from a different culture and you get the opportunity of visiting a new country. Usually people get a tidy sum which can be added to the savings. If the assignment is for a duration of 3 months to one year, you will get your salary in India and an allowance. If you stay in India for 60 days or more, the salary and the allowance is taxable unless the allowance is paid for expenses incurred above and there are valid receipts for the same. If you go abroad on a long-term assignment which means the duration is one year to three years, then you are on the payroll of the company unit abroad. During this assignment, if you stay in India for less than or equal to 182 days, you will not pay tax on income received abroad. If you stay in India for more than 182 days, you will be liable to pay tax on the income received abroad. 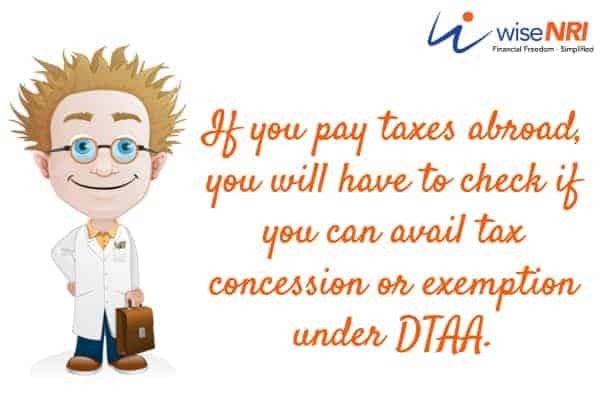 If you pay taxes abroad, you will have to check if you can avail tax concession or exemption under DTAA. 4) As an NRI, what are some of the investments that I can make in India? You can invest in equity shares and mutual funds. But you cannot short sell or be involved in intraday trading. You can invest in fixed deposits in FCNR deposits and NRE accounts. You can also invest in real estate, gold etc. Investments in bonds issued by Government of India, public companies and private companies are also permitted. If you think you will retire in India, you can invest in National Pension Scheme (NPS) too. 5) I am an NRI. Can I transfer the proceeds of the sale of property received to the country I currently reside in? If you purchased the house when you were a resident Indian, then the sale proceeds need to be credited to the Non Resident Ordinary (NRO) Account. If the property was purchased out of income earned in India or using a home loan taken in India and sold when you are an NRI, the amount must be credited in the NRO account. If the house is purchased by using funds earned abroad, then the repatriation can be only till the extent of the funds used for purchase. The excess sale consideration over the amount paid in foreign exchange can be remitted out of NRO account subject to USD 1 million per financial year per person. This is limited to sale of two such properties. 6) When do I not need to file an Income Tax Return? 7) Should I disclose my foreign bank accounts while filing taxes? It is not mandatory for NRIs to disclose the details of their bank accounts in the country of residence when they file tax returns. You can mention the details of the bank account in India so that the refund if any can be transferred there. If you do not have bank account in India you can give the details of the foreign bank account so that refund can be remitted to you. 8) How can I make an Aadhaar card? A circular issued on November 15 by Dr Ajay Bhushan Pandey, CEO of the UIDAI, has directed federal ministries and departments to issue directives to state governments and other relevant agencies that NRIs are not eligible to apply for an Aadhaar card. Few of the above questions are answered by Vidya – she is an NRI. 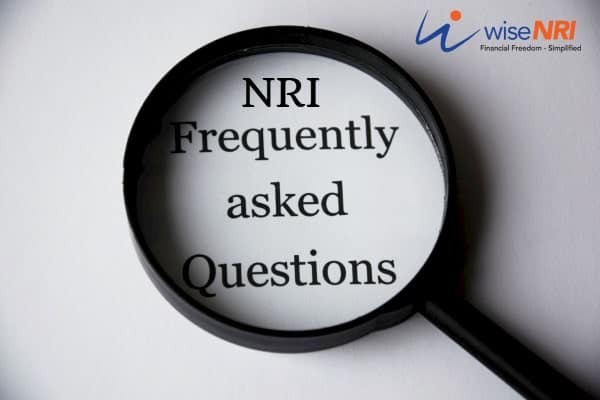 If you have any Questions related to NRI status – feel free to add in the comment section. Official procedure to withdraw matured PPF amount at concerned post office of NRI without his presence in India when even Special Power of Attorney is not considered by authority. As I have rental income of 15k/month which is 1.8L/annum, then in that case I don’t need to file return? Yes, no need to file returns. It is very nice of you to furnish so much of pertinent details that will help many NRIs to comply with GOI regulations. TY for this yomen service. My daughter bought a property in India in 2007 out of funds earned abroad. She was NRI at that time. Now she has become a USA citizen with PIO status. The information with regard to tax and repatriation of funds given in your blog- is it still applicable if she sells her property now, being a PIO? I will appreciate a post from you please. If I get inheritance in India .. I am an nri … what are my options to save on the 33 percent tax ? There’s no inheritance tax in India. Can you clarify your point? I understand that by adjusting the purchase price of a property in India using cost inflation index (CII), one can decrease the amount of long term capital gains (LTCG) taxes paid in India. Let’s say the original property purchase price is X, and adjusting for CII, the effective price is Y.
Let’s say the property sale price is Z. This means that property taxes in India are based on LTCG of (Z-Y). I am a US citizen. I understand that US residents need to pay taxes on worldwide income including LTCG for property sale in India, but the amount can be offset by taxes already paid in India. My question is: Is the federal LTCG tax owed in the US computed based on (Z-Y) or (Z-X)? How about state taxes for the state of California – is that based on (Z-Y) or (Z-X). I missed replying this – I think a US tax consultant will be the right person to answer.